There was a point this season where Ian Happ felt like the only thing that had gone right for the Cubs. The rookie came up in mid-May and immediately started raking. Ten of his first twenty-five hits went for home runs, and he was one of the few players keeping the team from sinking further in the standings. He even showed enough defensive capability to play every position in the outfield. He looked like the heir apparent to Ben Zobrist, but with less contact and more power. When Happ was called up, there was a question of how long he would be up with the team. Until this year, he hadn’t played a game above Double-A, and he only turned 23 a few days ago. Happ was never immune to getting sent back to Iowa, especially after Kyle Schwarber was sent down to get his swing back. But Happ carved out a place for himself on the 25-man roster, even if he’s looked overmatched in the past thirty days. In the second half, Happ’s struggles have been apparent, but perhaps overblown. The contact has remained relatively weak and his patience hasn’t improved; he’s still striking out in over a quarter of his plate appearances. Happ’s slump wasn’t unexpected. A rookie coming up and demolishing pitchers until the league makes an adjustment to him and throwing him into a slump is an old baseball tale by now. The adjustment in this case might be that he might not be able to hit sliders. His OPS against them is .528 and his o-swing% is 51.6 percent compared to his o-swing% against fourseamers of 27.3. He’s more likely to swing at a slider than any other pitch he’s seen more than 100 times this season. He’s swung at 59.1 percent of sliders; the next highest is changeups at 54.4. Until he can lay off the slider or figure out a way to do some damage when he sees them, he’s not going to stop seeing them. The most noticeable difference is the lack of power. There was no way Happ was going to have nearly half of his hits go for homers, but it was figured that some of those would turn into doubles. Between the All-Star Break and August 1st, Happ hit .200/.304/.250, so basically Kelby Tomlinson without the singles. His hard-hit rates have trended downwards, going from 35.3 percent in May to around 29 percent in June and July down to 26.3 percent in August. It’s hard to hit for power when you’re not hitting the ball hard. His HR/FB ratio also dropped from 26.5 percent in the first half to 12.5. The preponderance of first half power was certainly a mirage, but the latter is probably a little low, too. It’s possible that Happ is getting dinged by a few dreadful weeks. The first two weeks of August, he has looked a little more like the Ian Happ we can dream on. He had a pinch-hit homer over the weekend and a multi-hit game that included a double last week. He’s also had a couple 0 for 4s mixed in, but it’s encouraging to see the power hasn’t completely gone away. His streakiness has made it hard to predict what he’s going to do going forward. PECOTA has him projected for a .259 TAv and a .427 the rest of the way, so it’s expecting him to be worse. I’d take the over on that since PECOTA is designed to be bearish on unproven rookies. Happ’s current production would be fine if he were playing in his utility role, but there’s a vacancy at second with Baez covering shortstop until Russell comes back. 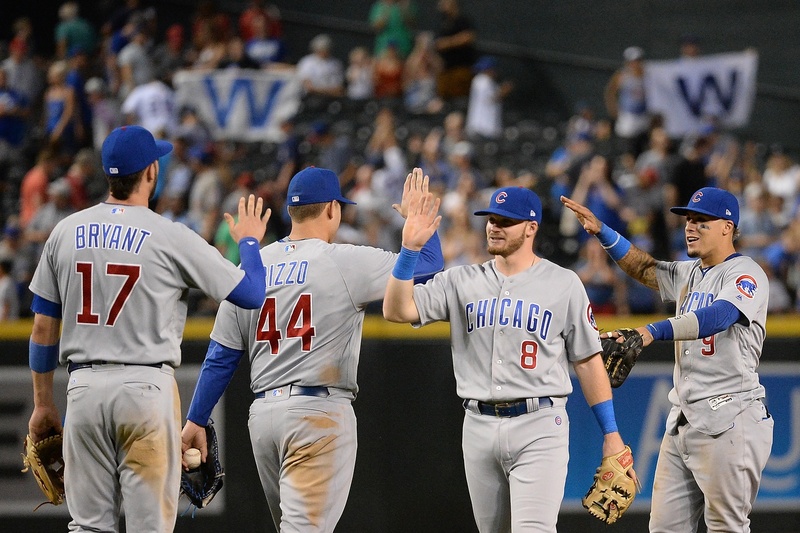 There currently isn’t a timetable for Russell’s return from the DL, and with Willson Contreras out until mid-September, there’s a bit more pressure on the rest of the offense to pick up the slack. Until Russell returns, it looks like it’s going to be second base by committee. There’s no clear option to fill in. Zobrist has had his own share of offensive struggles. Tommy La Stella has been good in limited playing time, but he lacks the ceiling of Happ and the experience of Zobrist. If Happ can get going again, second base should be his until Russell comes back. Instead, Happ will likely play a supporting role down the stretch, starting a few times a week and giving Joe Maddon flexibility in being able to make more double switches. The NL Central is still the Cubs’ division to lose. They could conceivably sneak their way into the playoffs only winning 85 games. But if these Cubs hope to contend in the postseason with the Dodgers (or even the Nationals or Diamondbacks or Rockies) they’re going to need production up and down the lineup, and Happ is going to find his way into the batter’s box one way or another.